For the third year in a row, Australia has been named the top country brand by the 2008 Country Brand Index (CBI). The CBI is a comprehensive study of global travel patterns and is conducted by leading brand consultancy FutureBrand along with PR firm Weber Shandwick. CBI was analysed with Australia, Canada and the US the most successful country brands. Australia was ranked No.1 in the categories of best country to extend a business trip, best country for resort and lodging options, the best country for outdoor activities and sports and the best country you would most like to live In. The CBI named China, the United Arab Emirates and Croatia as the top three countries most likely to become favoured tourist destinations in the next five years. It also noted that Africa, the Asia Pacific and the Middle East are experiencing higher growth rates than the average world demand. CBI, now in its fourth year, is a study of approximately 2700 international business and leisure travellers from nine countries. Africa, Asia and Middle East Experiencing High Growth for Travel & Tourism Demand, While Specialized Travel Increases with Growth in Women-Only Tours, Multi-generational and Religious Tourism. LONDON – Nov. 10, 2008 --- Australia earns the coveted spot as the world’s top country brand for the third consecutive year, according to the 2008 Country Brand Index (CBI) which was officially released Tuesday, Nov. 11, 2008 at London’s World Travel Market, the premier annual exhibition of the global travel trade. Rising from its sixth place ranking last year, Canada is recognized second and the United States rounds out the top three country brands in the 2008 study. Other countries making the top 10 include Italy, Switzerland and France. The CBI examines how countries are branded and ranked according to key criteria, and identifies emerging global trends in the world’s fastest growing economic sector – travel and tourism, which accounts for US$5.9 trillion of economic activity worldwide this year and more than 238 million jobs. CBI, now in its fourth year, is a comprehensive study of approximately 2,700 international business and leisure travelers from nine countries conducted by FutureBrand, a leading global brand consultancy, in conjunction with public relations firm Weber Shandwick’s Global Travel & Lifestyle Practice. 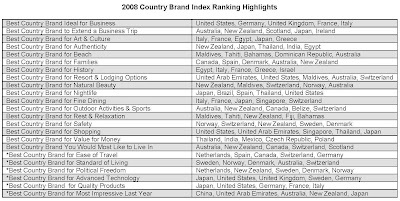 This year’s index includes rankings and trends as well as travel motivations, challenges and opportunities within the worlds of travel, tourism and country branding (visit http://www.countrybrandindex.com/ for complete results). The CBI also identified China, the United Arab Emirates (UAE) and Croatia, respectively, as the top three “rising stars” – those likely to become major tourist destinations in the next five years. Also making the list this year are Vietnam, India and Cuba. In addition, this year’s CBI includes an in-depth report of how China fares post- Beijing Olympics. “In this our fourth year, it is exciting to see many countries embracing the idea of brand. However, we still feel this is a largely underdeveloped category with most countries continuing to promote and market themselves in ways that are not differentiated. Particularly in the coming years, country brands must improve both their strategic orientation as well as their delivery,” said Rina Plapler, senior executive director, FutureBrand. This year’s CBI touches on a variety of topics relevant to travelers and tourism professionals including: intergenerational travel (represented by countries such as the U.S., Canada and Japan), medical tourism, mainstream luxury (represented by countries like Japan and Spain), ‘stay’cations and a rise in the off-the-beaten-track trips. Other notable trends this year focus on niche travel opportunities and the changing destination landscape. “With the current state of the world— economic turmoil, political unrest and global warming—it’s always fascinating to see which countries come out on top in branding themselves, generating global recognition and fueling the travel and tourism industry,” said René A. Mack, president, Weber Shandwick’s Travel & Lifestyle Global Practice. - Changing Landscape – Within the industry, there has been a significant shift in the countries that are experiencing real tourism growth. Traditional tourism “hotspots” are being overshadowed by rising star destinations. In terms of regional performance, Africa, Asia Pacific and the Middle East are experiencing higher growth rates than the average world demand. Chief among the changing landscape, citizens are becoming more outspoken about the brands their countries are aligning with to propel tourism, from branding efforts to logos to key messaging. The desire of many travelers to seek authentic vacation experiences has led to a rise in poverty travel – visiting poverty-stricken and/or polluted places and communities that showcase a reality otherwise unseen on an upscale or exotic expedition. o Rise of Women – Women are traveling more frequently without men, and women-only tours and retreats are becoming increasingly popular. Women comprise over half of adventure travelers worldwide. o Grandchild on Board – Affluent retirees in the U.S., Canada and Japan are traveling more and more. Half of vacationing baby boomers are now traveling with their grandchildren, indicating a new segment of multi-generational travel. o Finite Travel – There is a rise in people visiting places and/or species that are seen as endangered or in some form of time-related environmental risk. From polar bear and harp seal excursions to rain forest expeditions, many travelers are making it a priority to visit these places before they are irrevocably altered. o Spontaneous Travel – The biological imperative to escape will never go away, however, high pressured lifestyles and advances in online travel have resulted in consumers taking shorter trips each year, often booked last minute. o Religious Tourism – The concept of religious sites and pilgrimages is again becoming increasingly popular among travelers. For instance, the Vatican launched the world’s first airline for Catholic pilgrims. Specialized religious tours are catering to orthodox believers. - Luxury Flying Upgrades – Responding to need, many airlines have developed greater flight options and service classes to cater to the lucrative luxury travel market. These include First and Business Class only airport terminals, as well as new and improved upper class sections in airplanes introduced by leading carriers such as Singapore Airlines and Emirates Airlines. Additionally, there are a variety of new alternatives to conventional air travel that provide greater flexibility to the luxury traveler. Chief among them is the increased availability of regional jets and air taxis. Airports are upgrading at a faster rate, with technological advances such as Radio Frequency Identity (RFID), smart ID cards and self-check-in playing a greater role in the airport experience. The check-in process is also continuing to evolve, as airlines like Air Canada continue to develop bar code technology to allow passengers to board solely with their cell phones (without a printed e-ticket). FutureBrand has developed a three-tiered evaluation system for ranking country brands. This Index incorporates global quantitative research, expert opinions, and references relevant statistics that link brand equity to assets, growth and expansion. The result is a unique evaluation system that provides the basis of our rankings. Almost 2,700 respondents from nine countries including the US, UK, China, Australia, Japan, Brazil, UAE, Germany and Russia participated in a travel survey. Participants were screened to include frequent international travelers (who travel internationally more than once a year) between the ages of 21 and 65, with a balanced split between men and women. Business and leisure travelers were both included. Respondents answered questions about behavior around destination selection; country associations with particular attributes; and overall awareness/familiarity, past visits, intent to visit, and willingness to recommend destinations to others. Survey results were aggregated and weighted in proportion to their regions’ respective volume of travel consumption. This was done in order to minimize potential bias around preferred locations from respondents from regions that may have been over-represented in the sample. Performance on attributes by country was then considered against expert opinions and secondary statistics in order to generate the country rankings. 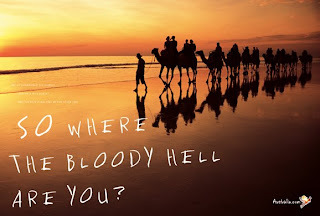 Hands down - Australia is definitely THE best place in the world not just to travel to, but also to live... immigrating here was the BEST decision I have ever made in my entire life!! I love the fact that there is virtually no racism or prejudice of any sort and I actually now own my own house and land (forever). i just came home from a particular country in Asia (begins with "S") and could not believe the racist attitude toward caucasians. will never go back there - i feared for mine and my family's life. that country is not anywhere in the top 5 lists of your highlights. no wonder. too much hate. they should take some lessons from the aussies.